Roofinox AG has its registered office in Liechtenstein and has been supplying the roof and facade specialists with the highest quality rust-free stainless steel for over 30 years. Roofinox stainless steel has been specially developed for use on the building envelope and can be found on roofs, facades and in the building’s drainage. 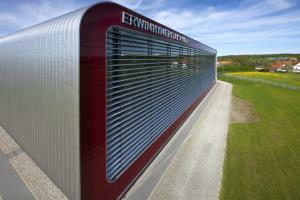 Roofinox stainless steel is made in their factory in Germany, is made from approx. 85% recycled material and is itself 100% recyclable. Roofinox stainless steel is available in various surface designs, offers an unbeatable life span and virtually free of maintenance. Roofinox was the first matt-finished brand name stainless steel on the market in 1999 and established itself very quickly. Roofinox stainless steel has its biggest market share in the central European Alpine region, where the weather also places special demands on the roofing materials – yet its fields of use are unlimited and constantly expanding. The popular traditional metal for optically appealing and very long-lasting roofs is also frequently used to restore historic roofs, for beauty and great durability. 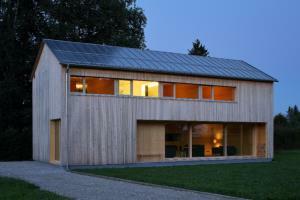 This is why it is therefore perfectly suited for modern roofs – for exactly the same reasons! Tin matte metal roofs go well with timber facades because both weather to natural grey tones, producing an organic, aesthetic look. The weathering process takes around 2 to 3 years. 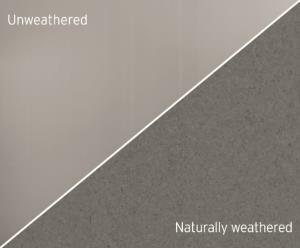 Roofinox Tin-matte is usually only used on roofs because a number of builders don’t want a naturally unequal patination, on the facade – this would be impossible to influence. Architects and builders are increasingly taking advantage of the many functional and optical advantages of stainless steel surfaces for the roof and façade. When choosing the right surface, the individual requirements are always important. All Roofinox stainless steel surfaces are specially created design surfaces. Each one has been designed to meet specific functional and aesthetic requirements. Roofinox Design Surfaces – Unique like no other.